(CNN)The Caribbean island of Dominica has been “devastated” by Hurricane Maria, the country’s Prime Minister tells CNN. The powerful storm, which made landfall Monday night, has since been downgraded to a Category 4 with sustained winds of 155 mph. 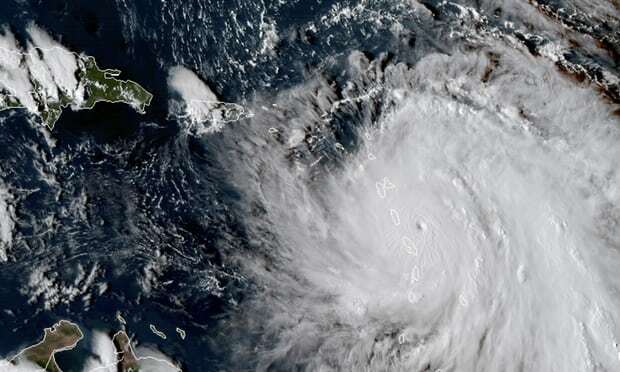 After it passes over Dominica it is on course to score a direct hit on the US territory of Puerto Rico — the first hurricane of its strength to do so in 85 years. “We’re just waiting for daybreak to do an assessment of the damage,” Dominica Prime Minister Roosevelt Skerrit told CNN’s Rosemary Church. Maria made landfall on Dominica late Monday, coming ashore at 9:15 p.m. ET. It was so powerful that it tore the roof off the Prime Minister’s residence. “Personally I was affected,” Skerrit said. “The roof of the residence caved in because of the strength of the wind. But I was taken to safe ground by … police officers, thank God. In a Facebook post he added: “So far we have lost all what money can buy and replace. The storm will continue moving toward Puerto Rico and the Virgin Islands as a strong Category 4 or a Category 5 and is not expected to diminish in strength. After Dominica, Puerto Rico is in Maria’s sights. It is moving toward the island as an “extremely dangerous major hurricane, and a hurricane warning has been issued for that island,” the hurricane center said. A hurricane warning from the NHC remains in effect for Guadeloupe, Dominica, St. Kitts, Nevis, and Montserrat, the US and British Virgin Islands as well as Puerto Rico, Culebra, and Vieques. US President Donald Trump issued an emergency declaration for the US territory for federal assistance to augment the territory’s storm-response initiatives. The ferocity of Maria bears striking similarities to Hurricane Andrew, the Category 5 hurricane which hit the Bahamas and Florida in 1992, says CNN meterologist Pedram Javaheri. Both storms are compact, and Maria’s wind speed comes close to that of Hurricane Andrew — 165 mph — when it hit southern Florida. “This sort of event is a very dangerous event, high winds, a slow storm and a lot of rainfall. And this coming just about two weeks after Irma skirted off the northeast of Puerto Rico.